Coconut Saras - Do You Know The Muffin Man? Notes: A co-worker lent me her copy of this book and I was impressed with the range of chocolate recipes from simple hot chocolate to complicated ruffle cakes to asparagus and cocoa nibs! The macaroons came out a little sticky; I had some whites in the fridge but forgot how many so there may have been one too many. They baked up really large too, so you could definitely get 30 instead of two dozen. I made the whipped ganache using PC bittersweet chocolate. After whipping, it was grainy so I either whipped it too long (about 30 seconds on high speed) or the chocolate didn't melt well. I'm leaning towards the latter as you can't expect too much from a bar that only costs $6. For the coating, I used bittersweet Callebaut which made a perfectly smooth coating. 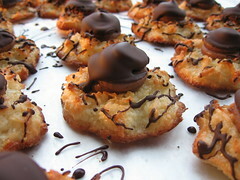 These were really tasty, the snappy outer chocolate shell, melt-in-your-mouth ganache and chewy coconut macaroon work well together.